It is always with an enormous sense of expectation (and trepidation) that I book to see an entirely Afrikaans-language production here in KZN. Die Reuk van Appels was the first ticket I booked for the festival this year, as I recalled what a lasting impression the original novel had had on me as a young man struggling with his own cultural identity in a changing South Africa. 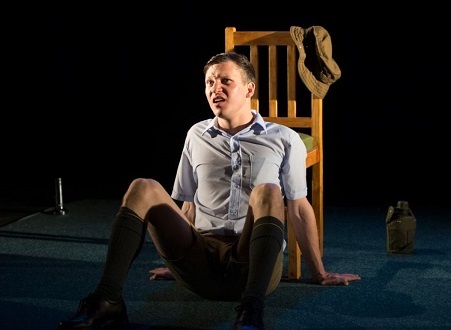 Following a national tour and sold out performances, this Naledi, Fleur du Cap and kykNET FIESTA Theatre Award-winning show, starring Gideon Lombard and directed by Lara Bye, played to full and appreciative, largely Afrikaans-speaking, houses at the Hilton Festival this year. Adapted from the acclaimed 1993 debut novel by Mark Behr, Die Reuk van Appels tells the uniquely South African coming-of-age story of Marnus Erasmus, the 11 year-old son of a South African Defence Force General, and the events surrounding a terrible trauma that he bears witness to. Lombard shines in this one-man tour-de-force, and transports the audience to a time when the Afrikaner nation were at the height of their power in South Africa, evidenced not only in the politics of the 1970s, but also in the social and cultural aspects of family life and entitlement. Although not overtly political in it thematic concern, Die Reuk van Appels certainly exploits this profound cultural appropriation in its exploration of familial structures and the role of a powerful patriarchy. While Marnus plays with his best friend Frikkie, the country wages war against non-white citizens, Angola and itself. The simple set (a chair, hat, spinning top and water bottle) is sensitively and beautifully lit, and the use of shadow and perfectly positioned gobos enhance the dramatic content of the narrative immensely. Interwoven in the text, and to allow transitions between scenes and to denote passages of time, are authentic recordings of radio broadcasts and political announcements from the era, as well as actual recordings of radio interactions between white Afrikaans soldiers engaged in combat on the border. Without revealing the shocking denouement, it is enough to say that the desperately thin veneer of civility that so often veils people of influence is ripped apart by the grotesque and brutal behaviour of a father whose entire life is meaningless and fraudulent. The impact on young Marnus is poignant and profound; the effect on the audience is both intoxicating and repulsive.